As for item IT-314-1,it is made by double layers material and wall is inflatable, the white out layer material is Oxford fabric and the black inside layer material is PVC tarpaulin. It is also make the whole set tent more economic. 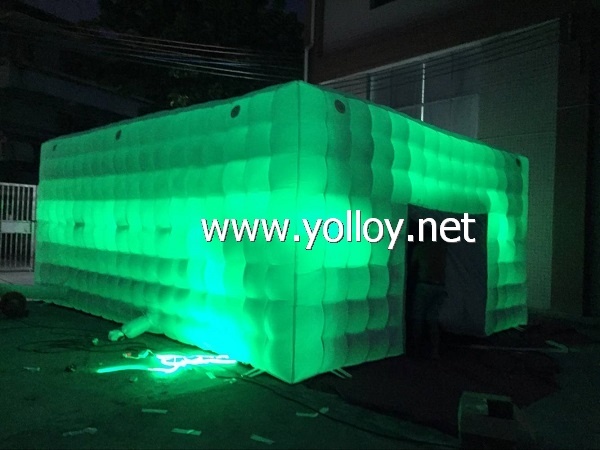 Since the wall is inflatable ,so we can set up the led light in the middle of the inflatable wall and it more attractive,since inside material is black,it can block outside lighting and keeping inside enough dark, it is very suit for haunted house game, isn' it? What's more,some of our clients also use it for movie projection tent. 1. We will reply your email as soon as we received it. 2. Skype and phone is 24 hours opening for your demand. 3. TQC for each production process. 4. 24-hours Infatuation & Deflation test for each product to avoid air leakage. 5. We will follow-up your after-service, if anything don't be satisfied, please let me know. We do our best to meet your demand and solve problem. If any interested in it,please do not hesitate to contact us,and we would like to assist you to produce the perfect tent you want.